More and more older people are living independently at home for as long as possible – often into their 80s. It’s a growing trend, reflected in the fact that more than 28 million seniors now live alone in the U.S. But they’re not doing it alone. Most receive varying levels of care and support from a relative, most often a daughter or daughter-in-law. “Aging in place” is what most seniors want. It’s where they are comfortable, where their memories are, and where they feel safe. It’s also what most of us want for our aging parents and relatives. And it works well. Until it doesn’t. Even the most dedicated caregiver needs to take a break now and again; may have medical problems of her own to care for; or may simply need some time to relax, refresh and regroup. That doesn’t make the caregiver a bad person. It makes her human. Frequently, it’s the stress of the holidays that forces the issue. There’s so much more to do in December: Shopping and decorating the house, attending special events, getting to the kids’ Christmas recitals, making sure Mom has food in the fridge and gets to her doctor’s appointments. It can be overwhelming. Fortunately, there is a way to relieve some of the stress … without neglecting Mom or shortchanging the family: Care Companions of Ohio. Care Companions of Ohio can help ensure that your aging relative is getting the proper nutrition, living in a clean home, with clean clothes to wear and someone to talk to and reminisce with. Care Companions of Ohio is not a home health agency. Rather, it’s a service that helps support the elderly person and the caregiver in achieving their goals for socialization, nutrition, companionship, household chores and more. Care Companions can provide transportation to the grocery store, doctors’ offices, church, special events … pretty much whatever’s on the schedule. Care Companions provide personal care services, such as help with bathing, personal hygiene and dressing. They provide laundry services and cook healthy, nutritious meals. Companions can help ensure that Dad takes his medicines and that Mom’s prescription refills are managed. And if all that’s required is someone to sit and listen for a spell – Care Companions can meet that need, too! Care Companions of Ohio is fully insured and provides services that are around the needs of each individual client and their families. Care Companions is a Passport Provider, but also accepts private pay and most insurances. Even better, Care Companions is completely flexible – personal care services are available anywhere from two hours a week to 24 hours a day. Respite care services are also available. Care can be provided once a month, once a week, or even once a year when you take a vacation or attend to other needs! Whatever the need Care Companions of Ohio are here to help! Call today to ask about Respite Care Services. Care Companions of Ohio serves the needs of our clients at each of our locations in Mansfield, Marion, Norwalk, and Portsmouth. Care Companions can give you the time and space you need to take care of yourself while ensuring your loved one’s needs are well-met. 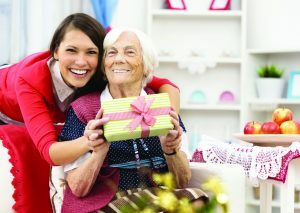 For more information about how Care Companions of Ohio can help you through the holidays, call (855) 703-8209.